- Rich editorial and multimedia content. - Enhanced experience by the use of horizontal and vertical iPad format. - High quality pictures of the most famous places to visit. - The Acropolis monuments as Parthenon, Caryatids, Erechtheion, The Walls. 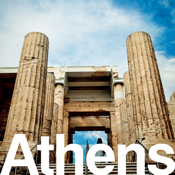 - Walking tours around the Acropolis. - Athens Archaeological Sites as the Temple of Zeus, the Ancient Agora (market),Thissio, the Roman Agora, the Prison of Socrates. - Modern monuments and buildings as the Metropolitan Cathedral, the Observatory, the National Theatre, the Varvakios Market in Athinas str, the famous Plaka and Monastiraki neighbourhoods, Gazi, Psiri and many more. - The New Acropolis museum among 10 others. - Useful information, admission fees and visiting hours for the museums and the archaeological sites.